U.S. allies and foes alike expressed dismay Wednesday over President Donald Trump's expected move to recognize Jerusalem as Israel's capital with some warning it could potentially trigger violence. The decision will "provoke Muslims and Christians alike," Jordan's King Abdullah predicted, while Pope Francis urged the White House to reconsider. Recognizing Jerusalem as Israel's capital would be an act of "madness" that would "plunge the region and the world into a fire with no end in sight," Turkish Deputy Prime Minister Bekir Bozdag said. Trump is expected to make the announcement in a speech later Wednesday, while delaying moving the U.S. Embassy from Tel Aviv. Officials told reporters that the president intends to fulfill his promise to relocate the diplomatic outpost but the process could take years. Recognizing Jerusalem would upend decades of American policy. The United States has never endorsed Israel's claim of sovereignty over any part of Jerusalem. A still image taken from video shows U.S. President Donald Trump and first lady Melania attending a ceremony commemorating the six million Jews killed by the Nazis in the Holocaust, in the Hall of Remembrance at Yad Vashem Holocaust memorial in Jerusalem May 23, 2017. Government Press Office via REUTERS TV ATTENTION EDITORS - THIS IMAGE HAS BEEN SUPPLIED BY A THIRD PARTY. FOR EDITORIAL USE ONLY. NOT FOR SALE FOR MARKETING OR ADVERTISING CAMPAIGNS. IT IS DISTRIBUTED, EXACTLY AS RECEIVED BY REUTERS, AS A SERVICE TO CLIENTS. Since the 1979 Camp David Accords, American presidents have refused to recognize Jerusalem as the capital of Israel or move the U.S. Embassy. The U.S. approach has been that Jerusalem's status should be negotiated between the Israelis and Palestinians. The Palestinians seek the city's eastern sector, captured by Israel in the 1967 Mideast war, as the capital of a future independent state. 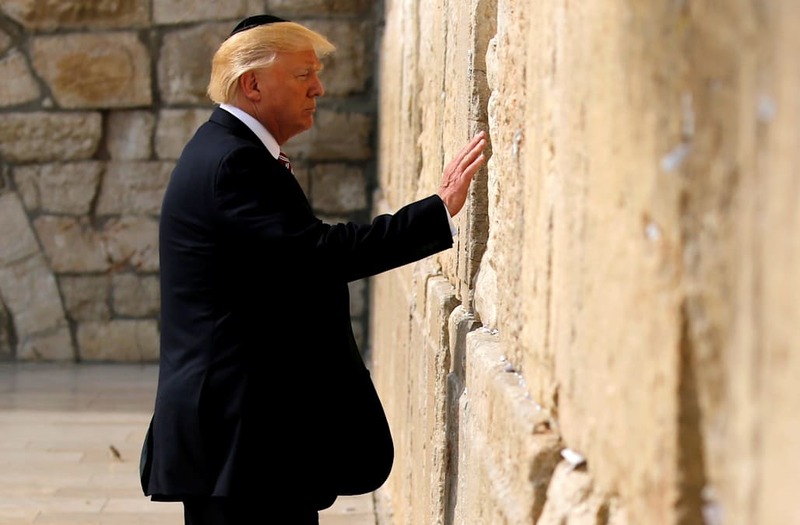 They fear that Trump's declaration essentially imposes on them a disastrous solution for one of the core issues in the Israeli-Palestinian conflict. "There is no way that there can be talks with the Americans. The peace process is finished. They have already pre-empted the outcome," Palestinian official Hanan Ashrawi told the Associated Press. "They cannot take us for granted." Jerusalem includes the holiest ground in Judaism. But it's also home to Islam's third-holiest shrine and major Christian sites, and forms the combustible center of the Israeli-Arab conflict. Any perceived harm to Muslim claims to the city has triggered volatile protests in the past, both in the Holy Land and across the Muslim world. One U.S. official said Tuesday that America's "policy of ambiguity" in regard to Jerusalem hasn't worked. "It seems clear now that the physical location of the American embassy is not material to a peace deal ... it's not an impediment to peace and it's not a facilitator to peace," the official said. Jerusalem is already home to Israel's parliament, Supreme Court and other government sites. Palestinian Authority President Mahmoud Abbas warned Trump in a phone call of "dangerous consequences" for peace efforts and regional stability, spokesman Nabil Abu Rdainah said. Ismail Haniyeh, leader of Palestinian militant group Hamas, said relocating the U.S. Embassy to Jerusalem "breaks red lines" and recognizing the city as Israel's capital would be "igniting the spark of rage against the occupation." Hamas also declared three "days of national anger" starting Wednesday, and called for protest rallies and sit-ins outside U.S. embassies and consulates in the region. Pope Francis expressed "profound concern" at Trump's move and that he prayed "wisdom and caution will prevail so as to avoid adding new elements of tension in a world ... already convoluted and marred by many cruel conflicts." In unscripted remarks after his weekly general audience at the Vatican, he said Jerusalem was "a unique city, sacred for Jews, Christians and Muslims," and urged that "everyone respect the city's status quo in respect to the pertinent resolutions by the United Nations." Germany issued a warning to citizens traveling in the region about protests, saying "violent clashes cannot be ruled out," while its Foreign Minister Sigmar Gabriel described Trump's plan as "counterproductive." British Foreign Secretary Boris Johnson has also expressed concern about the U.S. decision. Egypt's President Abdel-Fattah el-Sisi urged Trump in a phone call against "taking measures that would undermine the chances of peace in the Middle East," his spokesman said. However, Israel's justice minister urged Trump to not be intimidated by Arab threats of violence. "I wouldn't be worried about this event or the other," Ayelet Shaked told the Associated Press. "If Arab leaders take steps to prevent unrest, there won't be any unrest." Israeli Prime Minister Benjamin Netanyahu posted a short video on Facebook welcoming recognition of his country's "historical and national identity." Much of Jerusalem is an open city where Jews and Palestinians can move about freely, though a separation barrier built by Israel more than a decade ago slices through several Arab neighborhoods and requires tens of thousands of Palestinians to pass through crowded checkpoints to reach the center of the city. Interaction between the sides is minimal and there are large disparities between wealthier Jewish neighborhoods and impoverished Palestinian ones. In addition, most of the city's more than 300,000 Palestinians do not hold Israeli citizenship and instead are "residents." Trump's recognition of Jerusalem as Israel's capital could be viewed as America discarding its longstanding neutrality and siding with Israel at a time when the president's son-in-law, Jared Kushner, has been trying to midwife a new peace process into existence. Trump, too, has spoken of his desire for a "deal of the century" that would end Israeli-Palestinian conflict.